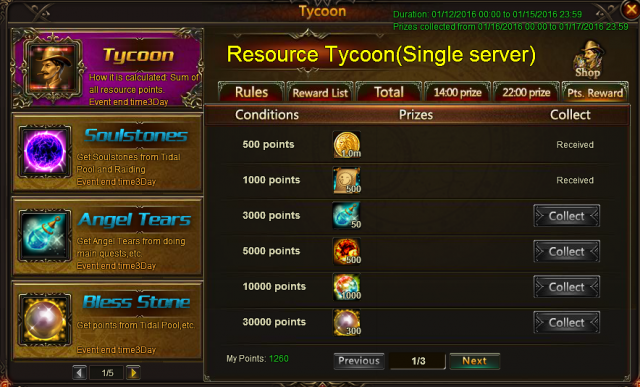 To make Resource Tycoon more wonderful and meet different needs of players in newly opened servers and those in previous servers, we optimize the prizes of it. The prizes will be different between servers opened within one month and other servers. Description: Collect the required resources to win Noelle's Icon, 5-Star Chaos Angel card, Parchement Chest(Epic), Magic Dust Chest (Epic), Mikaela Awakenning Stone, Hemera Awakening Stone and many other rare items! Hope you will like it. 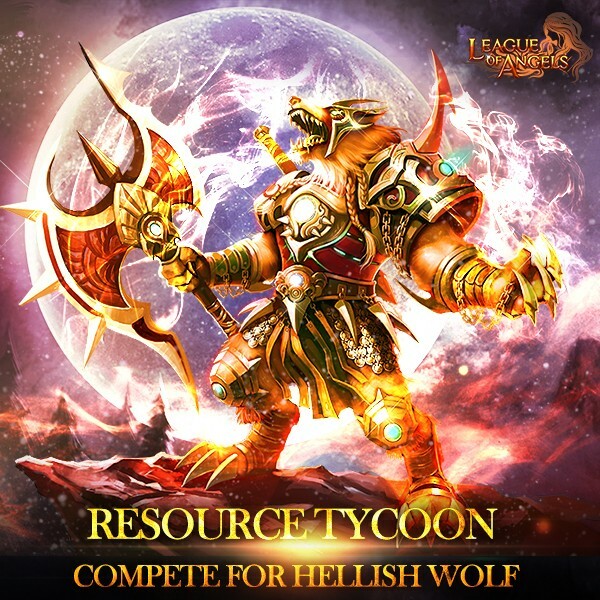 You can also exchange your Tycoon Points for Hellish Wolf Crest. Tip: There will be Time-limited Resources during Resource Tycoon event. Don't miss them out! - Click on the Tycoon icon on the left of the game window to open the Resource Tycoon menu. - For players of previous servers, you can gain points by collecting required resources during the event, i.e. Grotto Heart, Element Scroll, Angel Tears, Runestone, Blessed Stone, Seraph's Stone, Aegis Shard, Soulstone, Gold, Element Crystal, Enchanted Stone, Gems and Gem Enhancement Stone. - For players of newly opened servers, you can gain points by collecting required resources during the event, i.e. Spring of Wisdom, Angel Tears, Runestone, Blessed Stone, Seraph's Stone, Aegis Shard, Soulstone, Gold, Element Crystal, Enchanted Stone, Gems and Gem Enhancement Stone. - Each day at 14:00 and 22:00 the point leaders will be determined and prizes will be set accordingly. Prizes include Aegis Shards, Synth Scroll, Soulstones, Blessed Stone, Awakening Stone. - The grand prize will be issued at the conclusion of the event. Description: Use your tycoon point to exchange certain items. Rewards of servers newly opened within two month differs from those of previous servers. Attention! Tycoon Point Rewards has been removed to Tycoon event panel now! Check the screenshot below. Description: Reach certain tycoon period point to get great rewards. Rewards of servers newly opened within two month differs from those of previous servers. Description: Cheer for Tycoon! We provide you this chance to buy resources with great discount prices! This is a limited time event. You can buy 5 times in 1 day! Complete the goal to buy Resources with great prices! Description: Reach certain Tycoon points to get Tycoon Certificate! Description: When reaching certain points in Tycoon, you can get Moonlight Spirit, Hellish Wolf Crest x1, Luminous Steed with your Tycoon Certificate. Description: This is a mysterious deal for all tycoons. They swap the extra rare items for other items in need. Compete for what you need now! More exciting events are coming up through Jan 12 to Jan 15 (server time). Check them out in the in-game Hot Events menu now!